The Flood Tank Form is a type of Flood Pure Form. When a Stalker Form is cornered or confronted with well-armed opponents, it will often undergo a rapid transformation into a Tank Form to better defend itself. Most of the Stalker's body mass shifts to the frontal body section, forming a muscular torso. The rear limbs are augmented with muscle to serve as legs, while the forelimbs become bulkier and rapidly extrude bone structures to form blade or club-like appendages. In this state, the Tank Form is more resistant to conventional weaponry and possesses more devastating melee capabilities, but moves at a far slower pace. Tank Forms are quite slow in comparison to Combat Forms, but they make up for it with relative resilience and devastating melee attacks. They can run on all fours for a short period, allowing a short burst of speed to overtake a target. Tank Forms can spew a torrent of Infection Forms from their 'mouth' as a form of short ranged attack, or in order to infect nearby corpses. On rare occasions, a Tank Form will mutate directly to/from a Ranged Form. When shot, the Tank Forms usually cover their faces (which are usually their weak spots) with the bony plates on their arms. Try to avoid shooting the plates as they don't take any damage. Tank Forms are usually very slow except for the moments where they charge. Try to flank them, but do not move away too much as it may transform into a Ranged Form or Stalker Form to chase after you or to shoot from a distance. They are very resilient to most firearms, although plasma seems to affect them more than normal ballistic weaponry. Melee weapons like the Energy Sword and the Gravity Hammer and most power weapons work very well against them. 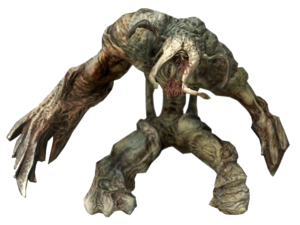 The Flood Juggernaut, a Flood Form cut from Halo 2, was an early concept of the Halo 3 Pure Form. The Sharquoi, another deleted species from Halo 2, may have served as the inspiration for the Tank form. This is further proven by a piece of concept art in The Art of Halo 3 that appears to be three Flood Juggernauts engaging several Marines and the Master Chief in combat. The design of the Tank Form is reminiscent of the Drinniol (or "Hulk") enemies from Marathon, one of Bungie's earliest games. Tank forms are the only Flood Pure Forms that are not able to cling onto walls. They are very similar in appearance to the Flood Thrasher Form. There is an easy way to kill a Tank Form other than using an Energy Sword. If you just melee him in between the two tentacles on his head he will die instantly, although it can be hard to hit it in the kill spot if it's swinging its arms and moving around. When a Tank Form takes a hit from a Gravity Hammer, the spike platform can be seen for a few seconds when the Tank Form jumps up. Tank Form in the Halo 3 Bestiarum. An image of a Flood Tank Pure Form in Voi. A Tank Form on the exterior of the Control Room of Installation 08. A tank form in Halo: Combat Evolved Anniversary's terminals. Concept art for Halo Wars 2 depicting a tank form. Flood tank forms on Installation 04 in Halo: Fireteam Raven. Victor Ramos fighting a Tank Form.